$1,100.00 Distinguished NKVD Employee badge, Type 2 in bronze, #4311, 1942-1946. Highest WW2 era award of officers of State Security, SMERSH and NKVD. In very fine condition, far better than the average. $940.00 Distinguished MVD Employee Badge, early bronze type, #4904, circa late 1940s. Note the serial number which is extremely low for a Distinguished MVD badge and very close to the NKVD serial number range. In excellent condition. $795.00 Distinguished MVD Employee Badge, Type 2 in silver, #15126, circa 1980s. Highest decoration of Soviet Police and MVD. In outstanding condition. $1,700.00 Badge of Distinguished Employee of MOOP, Variation 1, #7917, circa early to mid-1960s. In outstanding, excellent condition, one of the best we have seen of the rare MOOP version. This award was issued for only a very short time from 1962-68, and is therefore far more scarce than similar MVD or even NKVD "eggs". $1,950.00 Honored State Security Employee badge, Variation 5, unnumbered, circa mid to late 1980s issue. Unlike vast majority of Honored KGB Badges, this exceptionally rare piece never had a serial number. A rather scarce version in and of itself even if serial numbered, this particular specimen is also a textbook example: it is prominently featured in the reference book "Cheka" by Robert Pandis (C. 2017) In excellent condition. A truly unique opportunity for the advanced collector of Soviet law enforcement awards. $1,450.00 Honored State Security Employee badge, #3219, circa late 1960s. Extremely rare version featuring smooth reverse and prongs (rather than rivets) attaching the star. In our estimate, no more than 200 of these were ever made. In outstanding condition. $695.00 Badge of Honored Employee of the Office of Public Prosecution, 1981-1991. Only approximately 1500 of these were ever awarded. In excellent condition. $220.00 50th Anniversary of KGB badge. Official all-Union award issued in 1967 to qualified State Security officers. In excellent condition. $140.00 Document for the KGB 50th Anniversary Badge, December 1967 issue to an Estonian. Shows autopen signature of KGB Chairman Yuriy Andropov. 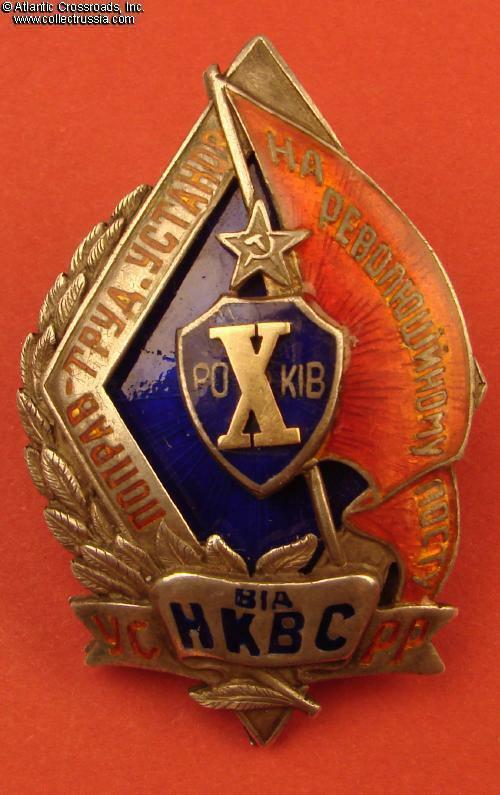 $45.00 Badge for 50th Anniversary of VChK-KGB, 1967. Although exact criteria for this award are unknown, it was definitely one of the official KGB issues, probably to State Security retirees and VIPs. $50.00 50th Anniversary of KGB, commemorative badge in aluminum for KGB low ranking employees and auxiliaries, 1967. Variation with clear center. Maker marked "LE" (Lenemalyer Factory in Leningrad). Excellent condition. $275.00 50th Anniversary of the First Main Directorate of KGB (aka Sluzhba Vneshnei Razvedki or Foreign Intelligence Service), commemorative badge, 1970. Extremely scarce commemorative award of the spying branch of the Soviet Committee for State Security. Excellent condition. $395.00 Badge for 50th Anniversary of KGB of Armenia, 1970. Excellent condition. This badge is among the hardest to find of the "republican" KGB series. $90.00 50th Anniversary of KGB of Georgia, commemorative badge, 1971. In excellent condition. One of the more scarce badges of the KGB anniversary series. $95.00 50th Anniversary of KGB of Uzbekistan, commemorative badge, 1974. Excellent condition. $295.00 50th Anniversary of KGB of Kirgizstan, commemorative badge, 1975. Variation with green border. This is one of the most scarce badges of the "republican" KGB anniversary series. In excellent condition. $295.00 60th Anniversary of KGB badge, 1977. A higher level, all-Union award to active duty State Security officers. In excellent condition. $280.00 Document for KGB 60th Anniversary Badge, 1977 issue. Shows facsimile signature of Andropov, Chairman of KGB and future Soviet premier. An interesting, early issue document in near mint condition. $95.00 60th Anniversary of KGB Special Departments (Osobye Otdely), commemorative badge in aluminum awarded to veterans, 1978. Very scarce. Excellent condition. $40.00 60th Anniversary of KGB, commemorative badge in aluminum for KGB low ranking employees and auxiliaries, 1977. Maker marked "LE" (Lenemalyer Factory in Leningrad). Excellent condition. $190.00 60th Anniversary of the First Main Directorate of KGB (aka Sluzhba Vneshnei Razvedki or Foreign Intelligence Service), commemorative badge, 1980. Scarce commemorative award of the spying branch of the Soviet Committee for State Security. Shows Moscow Mint logo on the reverse. Excellent condition. $170.00 60th Anniversary of KGB of Georgia, commemorative badge, 1981. In excellent condition. This badge is one of the hardest to find in the "republican" KGB anniversary series. $130.00 60th Anniversary of KGB of Uzbekistan, commemorative badge, 1984. A nicely made mint-marked piece in Excellent condition. $250.00 Document for KGB 70th Anniversary Badge, December 1987 issue. In near mint condition. $125.00 70th Anniversary of the Dnepropetrovsk / Yekaterinoslav Department of KGB, commemorative badge, 1989. Extremely uncommon award of a regional rather than all-Union or republican state security agency. In near mint condition. $80.00 Badge of a Veteran of the 308th NKVD Partisan Motorized Rifle Regiment, circa 1970s-80s. Extremely scarce badge issued to a veteran of an NKVD Septsnaz unit created during the defense of Moscow specifically to wreak havoc in the German rear. In general, any badges awarded to members of specific WW2 partisan units as opposed to larger territorial formations or "movements" are very uncommon. Excellent condition. $220.00 70th Anniversary of Soviet Foreign Intelligence Service (INO- PGU), commemorative medal, 1990. A very uncommon award issued to the veteran Soviet spies just before the collapse of the USSR. In near mint condition. $120.00 Membership Badge of the Association of Veterans of Foreign Intelligence Service, early 1990s. The badge was awarded starting from 1991 for several years after the collapse of the USSR. Miniature or lapel format but very nicely made, mint marked piece of the same design as the larger 1991 badge For Service in the SVR Foreign Intelligence. $750.00 Voroshilov Marksman Badge, 2nd level, GUPVO (Border Guards and Internal Army), 1934-39. A very scarce version awarded exclusively to servicemen of the NKVD GUPVO agency which included GULAG camp guards and NKVD border troops. Impressive 2" tall badge in very fine to excellent condition. $75.00 Table Medal Commemorating the 60th Anniversary of the Dinamo (Sports Club of the Soviet Law Enforcement). Features bas- relief of Felix Dzerzhinsky. A limited edition medal in Bronze struck at the Leningrad Mint in 1983. $5,900.00 Rudzutak Advanced Training School for the Security Command Personnel of the Roads of Transportation (Railroads), 3rd Graduation Class, #26, 1928 issue. A beautiful, very elaborately designed piece in hallmarked silver and enamels of literally Faberge quality. In excellent condition. A very small number of these badges were ever issued and only a few are known to exist today. Many of the high level state security / law enforcement officers who had graduated from the Rudzutak School became victims of purges during the 30s. An arrest of the original owner usually led to the badge being confiscated and destroyed. Incidentally, Rudzutak himself was arrested, tortured and executed in 1938 thus making him an "enemy of the people" - and making ownership of the badge bearing his name a very risky proposition! To see other other badges of Soviet law enforcement schools that we currently have in stock, follow this link: "KGB, Police and MVD School Badges"
$70.00 60th Anniversary of KGB Border Guard Troops, award badge, 1978. Excellent condition. $60.00 70th Anniversary of KGB Border Guard Troops, award badge, 1988. Excellent condition. $140.00 Excellent MVD Border Guard badge, scarce two-piece flat back variation by the Pobeda Factory, 1953 - 1957. More massive than a relief reverse version, this version features the "MVD" plaque and a separate central shield superimposed on the larger shield with green border. An impressive badge in very fine condition. $175.00 Excellent MVD Border Guard badge, scarce three-piece flat back variation by the MTKh Factory, 1953 - 1957. More massive flat back version with superimposed "MVD" plaque. An impressive badge in very fine condition. $120.00 Excellent MVD Border Guard, relief reverse variation, 1953 - 1957. In very fine to excellent condition, far better than the average. $95.00 Excellent Border Guard badge, 1957-1964. In superb condition, very uncommon for this badge. $40.00 Commander of a Border Guard Patrol breast badge, "parallelogram" type, circa 1970s. In excellent condition. $15.00 Excellent Border Guard badge, 1st cl., 1970s - 80s. Excellent condition. $30.00 Award Document for an Excellent Border Guard, 1st cl. badge, 1970s-80s. In excellent condition. $10.00 Excellent Border Guard, 2nd cl. badge, 1970s-80s. Excellent condition. $45.00 Simferopol (Crimea) Border Guard Unit, Western Border Guard District, veteran's badge, circa 1980s. In excellent condition. $45.00 Nizhnedenstrovskiy (Lower Dniester) Border Guard Unit, Western Border Guard District, veteran's badge, circa 1980s. In excellent condition. $25.00 Badge for Completing 100 Border Patrols, Central Asian Border Guard District, 1982. $29.00 Badge for Completing 500 Border Patrols, Central Asian Border Guard District, 1982. $45.00 40th Anniversary of the Baltic Border Guard Detachment, commemorative badge, pin back version, circa 1980. Excellent condition. $39.00 40th Anniversary of S.M. Kirov 102nd Vyborg Border Guard Unit, commemorative badge, 1980. $50.00 Excellent MVD Policeman badge, 1953-1962 issue. In very fine to excellent condition, with well-preserved enamel and details. Original screw plate is included. $30.00 Excellent MOOP Policeman badge, 1962-1970. Excellent condition. Includes original Pobeda Factory screw plate. $40.00 Excellent Serviceman of MOOP Internal Army badge, 1962-68. Uncommon version with light counter-relief and very bright red of the plaque and star. In near mint condition and includes original screw plate. $22.00 Badge for Excellent Service in MVD, 1985-1991. Brass, enamels, solid quality. Awarded to Prison Guards of Soviet jails and correctional labor camps. $30.00 Distinguished Local Police Inspector badge, 1987-1991. Near mint condition. $15.00 Badge for Distinguished Service in MVD, 1st cl., 1970-1991. $7.00 Badge for Distinguished Service in MVD, 2nd cl., 1970s-1991. $15.00 10th Minsk Conference of Excellent Policemen, participant's badge, 1972. Excellent condition. $20.00 Badge for Active Participation in Providing Cultural Entertainment for MVD, 1980s. $20.00 Second All-Union MVD Performance Arts Festival, participant's badge, 1977. $25.00 Medal (Honorary Badge) of Excellent Propagandist of MVD, circa 1980s. Excellent condition. $75.00 Badge for Excellence in Local Antiaircraft Defense, late 1950s issue. An oddity of Khrushchev era, this badge was awarded during a short period when Soviet Civil Defense was directly subordinate to MVD (Ministry of Interior). In excellent condition. $850.00 Honored RKM Policeman (XV Anniversary of Soviet Police) badge, Type 2 Variation 3, #685, 1933-40. This highest pre-WW2 award of NKVD Policemen is equal in rank to the badge of Honored NKVD Employee. In very fine condition. $15.00 50th Anniversary of Soviet Police, commemorative badge, 1967. $15.00 60th Anniversary of Soviet Police, commemorative badge, 1977. $25.00 60th Anniversary of Soviet Police, commemorative badge, 1977. $40.00 60th Anniversary of Moldavian Police, commemorative badge, 1984. Excellent condition. $20.00 70th Anniversary of Soviet Police badge, 1987. Excellent condition. $50.00 70th Anniversary of Criminal Investigations Department (Ugolovnyi Rozysk), commemorative badge, 1988. $45.00 70th Anniversary of the Criminal Investigation Departments, commemorative badge, 1988. Highly unusual reverse, featuring an eye symbol of the criminal investigations and blank spot for serial number or name. Mint marked "LMD" on the medallion and suspension device. In excellent condition. $95.00 Badge Commemorating the 20th Anniversary of the Department for Protecting Diplomatic Missions, Moscow Police, 1987. In brass, enamels and lacquer, maker marked. Extremely scarce badge in excellent condition. $20.00 50th Anniversary of the Soviet Court System, commemorative badge, late 1960s. $80.00 50th Anniversary of the BKhSS Department of the MVD, award badge, 1987. In excellent condition. $25.00 50th Anniversary of Police of Turkmenistan, commemorative badge, 1985. $20.00 55th Anniversary of Soviet Police, Kirovskiy District, Moscow, commemorative badge, 1972. $25.00 60th Anniversary of the Soviet Transport Police, commemorative award badge, 1975. Very fine to excellent condition. $35.00 Commemorative badge for the 50th Anniversary of the MVD Internal Army Unit #6608, City of Solikamsk, 1991. The code name of the unit stands for the 31st MVD (Prisoner) Convoy Brigade, earlier known as 7th MVD Convoy Regiment. One of the last MVD badges of the Soviet period. In excellent condition. $30.00 50th Anniversary of the Dzerzhinsky Separate Special Purpose Division of MVD Internal Army,	veteran's badge, 1974. $20.00 9th Convention of Excellent Policemen of Minsk, participant badge, circa 1970. $25.00 5th Anniversary of the Domodedovo Airport OVD (Police Department), Moscow Regional Agency of Internal Affairs, commemorative badge, 1991. One of the last law enforcement badges of the Soviet era. $15.00 MVD / Police Officer Qualification Badge, 1st cl., 1972 - 74. In excellent condition. $8.00 MVD / Police Officer Qualification Badge, 3rd cl., 1972 - 74. In excellent condition. $9.00 Police Qualification Badge, 3rd class, 1972-74	Aluminum, paint. Maker marked. $95.00 M 1937 Police Officer hat badge, 1937-39. A very well made and attractive badge. Missing the attachment prongs but the obverse is in excellent condition. For other Police hat badges, please visit our category "Hat Badges" (under "Soviet Militaria "). $220.00 Police Officer hat badge, 37 mm version, 1937-1939. In excellent condition, outstanding for this badge. $20.00 50th Anniversary of Moldavian Soviet Police, commemorative medal, 1974. $95.00 Hat Badge of a Criminal Investigator or Prosecutor, 1956-1964. Extremely well made piece in excellent condition. $350.00 Badge of a Foremost Worker of the Department of Correctional Labor Camps (OITK) of the Latvian Soviet Socialist Republic, circa 1950s. In very fine condition. This is one of the only Soviet awards with direct reference to correctional labor. $450.00 Badge of Honored Road Builder, #7304, circa late 1940s - early 1950s. In near mint condition. $1,400.00 Badge to a Shock Worker of Ukhta (Ударнику Ухтинцу), late 1930s. This is one of the more rare badges of the infamous GULAG. Fabulous piece in superb condition; includes original, functional screw plate. $975.00 Badge to a Shock Worker of MVS (Moskva - Volga Canal Construction), 1930s. In excellent condition, and includes original maker marked screw plate. $390.00 Dneprostroy Badge, #1346, 1932. Awarded for participation in the construction of the Dneproges hydroelectric dam, the cornerstone project of the First Five Year Plan. Most recipients were NKVD officers who supervised forced labor. This attractive silver and enamel badge is in very fine to excellent condition, one of the best specimens we've seen. $35.00 Kuibyshev Hydroelectric Complex Construction Badge, 1957. Pin back version in outstanding condition. $60.00 Kuibyshev Hydroelectric Complex Construction Badge, 1957. Screw back version in excellent condition. $75.00 Badge of an Honored Master of Logging and Timber Rafting, #1190, circa 1960s. In near mint condition; comes in original wrapper and issue box. $1,250.00 Badge for Excellence in NKVD Dal'stroy (Far Eastern Construction), #1041,	early to mid 1940s. In excellent condition. $290.00 Brigadmil Voluntary Police Support Unit badge, 1930s. Fine to very fine overall condition. $15.00 "Druzhinnik" Voluntary Police Badge, Leningrad Mint version, circa 1960s. $9.00 "Druzhinnik" Volunteer Police Support badge, circa 1960s. $5.00 "Druzhinnik" Voluntary Police Badge, 1970s-80s. $25.00 Estonian Volunteer Police Support badge, 1950s-60s. Attractive badge in brass and enamels, in Excellent condition. $19.00 25th Anniversary of the Leningrad DND (Volunteer Police Support), commemorative badge, 1984. $15.00 Badge for Active Work on Protecting the Public Order, VLKSM Central Committee issue, mid to late 1970s. $5.00 VLKSM OKOD Unit badge, 1981-1991. $20.00 Bryansk Komsomol Operativnyi Otryad (Police Field Support Unit) badge, circa 1960s-70s. $15.00 Badge for Active Work, Leninskiy District OKO	(Operativnyi Komosomol'skiy Otryad), city of Gorkiy, circa 1970s. $10.00 Chelyabinsk OKO (Operativnyi Komosomol'skiy Otryad), membership badge, circa 1970s. $10.00 Chelyabinsk Young Friends of Police, membership badge, circa late 1970s. $10.00 Chelyabinsk Dzerzhinets (Komsomol Police Support unit), membership badge, circa late 1970s. $10.00 Membership badge of the Seventh Conference of DND (Volunteer Police Support), Nevskiy District, Leningrad, circa 1970s. $40.00 Badge to a Participant of the Public Protection Service During the XXII Olympic Games, 1980. Excellent condition. $35.00 Photo ID of a Traffic Safety Druzhinnik, 1964. Excellent condition. $350.00 Village Sheriff, identification breast badge, circa late 1920s. In very fine condition, very uncommon to find for this badge. Comes with original maker marked screw plate. $15.00 MVD Internal Army Sentry Post Commander, identification breast badge, 1978-1991. $35.00 State Bank Security and Cash Collection Service, identification breast badge	with individual serial number, late 1980s. $40.00 Subway Police Sentry Post, identification breast badge with post's serial number, late 1980s. Excellent condition. $10.00 VOKhR Security Guard, Sentry Post Commander identification breast badge, 1980s. $30.00 Medal for 70th Anniversary of the Customs Agency, 1988	Excellent condition. $30.00 Customs Officer identification breast badge, 1978 - 1987. $30.00 State Customs Officer identification breast badge, 1987-1991. $2,500.00 Honored NKVD Firefighter badge, Type 2, #431, 1937-1941. Magnificent piece in hallmarked sterling silver. Condition is very fine, outstanding for this early issue. $30.00 Excellent MVD Firefighter, unnumbered, circa mid to late 1980s. Brass and enamels, mint marked. Near mint condition. For other Soviet Firefighter badges, please visit our category "Firefighter Badges". $59.00 "History of Awards and Insignia of Russian MVD, 1802 -2002" Mikhail Rogov, C. 2004, Moscow. Russian text, massive format hardcover, 543 pp. The first truly comprehensive reference on the subject, featuring superb photography of a vast array of MVD materials.